The journal is a peer-reviewed edition that supports a policy of open access to scientific publications. Field of science and issues in focus: The journal aims to illuminate the urgent problems of scientific support of the transport, rolling stock, transport infrastructure, information and intellectual systems on the transport and the disclosure of the fundamental and applied researches results, advanced scientific approaches to the technology development, analysis of management, economic and ecological aspects of transport enterprises operation and transport construction, as well as the improvement of higher school activity. Certificate of state registration: 19609-9409PR from 29.12.2012. Edition is included in the list of scientific professional publications of Ukraine by the Order of the Ministry of Education and Science of Ukraine 29.12.2014 г. no. 1528 (technical sciences). Placement of the journal in the international scientometric databases, repositories and search engines: Ulrichsweb™ Global Serials Directory, Crossref, DOAJ, Google Scholar, Index Copernicus, OCLC WorldCat, "Україніка наукова". - Presence of scientific indicators: ORCID, ID Scopus, Researcher ID. DNURT received the Certificate of Quality of Scientific Publications 2017! 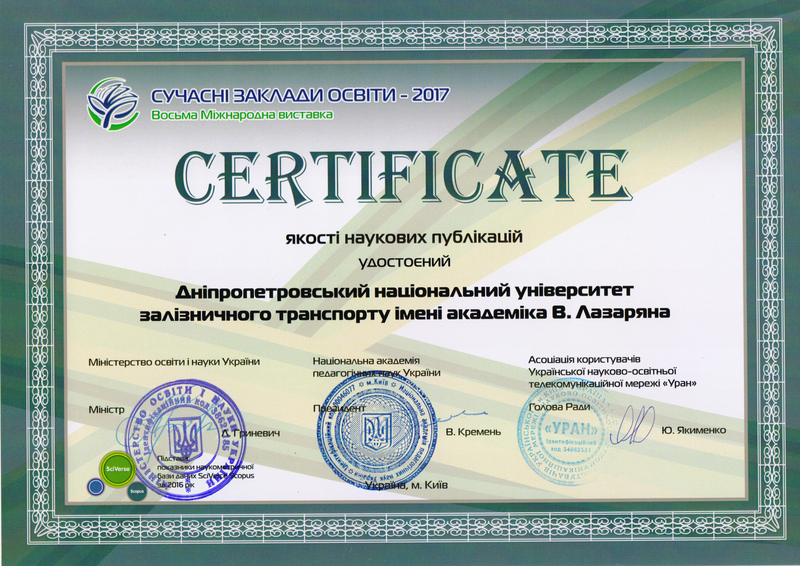 Dnipropetrovsk National University of Railway Transport named after Academician V. Lazaryan received the Certificate "The Quality of Scientific Publications" for compliance of publication "Science and Transport Progress" to the international standards, the level of its integration into the international database of scientific and technical information (including abstract). 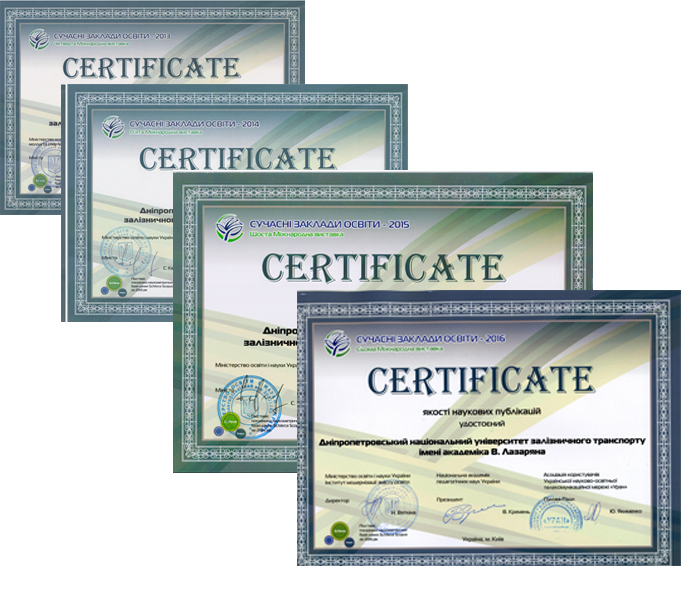 DNURT obtained the Certificate of Quality of Scientific Publications! 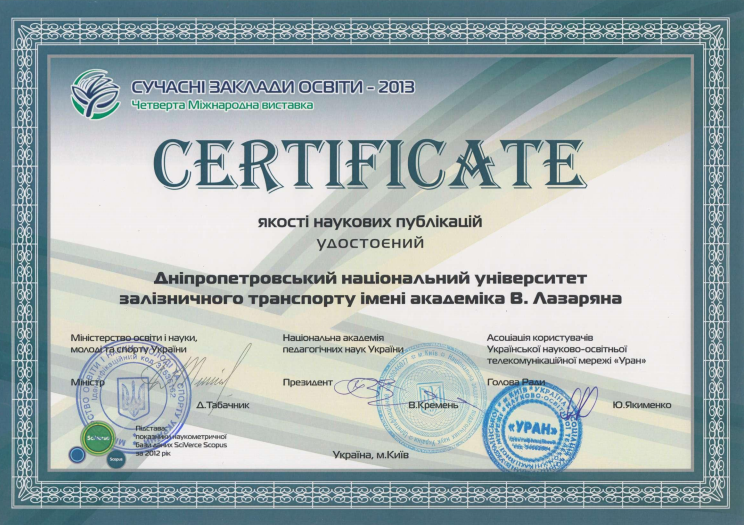 Dnipropetrovsk National University of Railway Транспорт named after Academician V. Lazaryan the 3rd year in a row received the Certificate "The Quality of Scientific Publications" for compliance of publication "Science and Transport Progress" to the international standards, the level of its integration into the international database of scientific and technical information (including abstract).